Disclosed are systems and methods for testing, classifying and sorting at least a photovoltaic device. The method comprises the steps of testing, classifying, and sorting the photovoltaic devices, wherein at least a storage with a smaller filling time is used for at least a class with a higher value of photovoltaic device distribution. The present invention relates generally to classifying photovoltaic (PV) devices, and more particularly, to systems and methods for testing, classifying, and sorting PV devices in a fast, robust, cost effective, secure, and environmental friendly manner. For the production of solar cells, first wafers are manufactured. The wafers are thin slices of silicon (mono or polycrystalline) which sawn from a brick of silicon. After the wafers have been made they are treated to get the photovoltaic properties. The surface of the wafer is etched with a chemical process to reduce the depth of the defects and then the wafer is structured to improve its optical properties. A p-n junction is made by doping the silicon with appropriate contaminations and then an anti-reflex layer is applied. Once this has been done, electrical conductors, for example, fingers and busbars, are deposited on top of the cells and are fired in a furnace. At the end of the production line, cells are tested to evaluate their proprieties. Now the wafer has become a solar cell that incorporated in a solar module. In all steps from the cutting of the wafers to the application of the fingers, the cells may be damaged. The handling alone or the treatment they get can damage them. Also the treatment itself may be more or less successful. Therefore the quality of the wafers and cells has to be monitored. The quality tests can be done at the end of the wafer and or the cell production or at the beginning of the module production. Depending on the tests done, the wafers or cells are sorted. Defects, e.g., holes, edge defects, cracks, can appear all along the PV device, i.e., wafer and cell, production line caused by processes or handling. They have to be detected because cells or wafers with such defects can not be used any more to produce modules. Saw marks appear during the sawing process of the wafers. These marks mechanically weaken the wafer that can breaks during the following manufacturing processes or create irregularities that can induce defects during the Screen printing process. Micro-cracks are small cracks which are not visible to the necked eye. These micro-cracks are always present in wafers but only some are dangerous and can grow during the following manufacturing processes in the cell or the module production. At the beginning of the cell production, cells have to be clean, without any residues at the surface to ensure the good performance of the production. All types of residues such as abrasives or dirt have to be detected at the end of the wafer production. Properties of wafers or cells that may be tested/monitored and evaluated includes: holes, edge defects, cracks; saw marks; micro-cracks; residues, e.g., abrasives and dirt; electrical proprieties, e.g., Isc, Voc, Mpp, Rshunt, Rseries; cell size, cell contour shape, busbar position and size; cell thickness and bending; bus bar and finger interruptions and disconnections; colour, detection of defects in antireflection layer; shunts, inclusions and small diffusion lengths of minority carrier. Prior art discloses different techniques for testing or evaluating the quality of solar module production, however they are limited to inspect general characteristics of the cell or the solar module, for example, inspecting a solar module for bubbles formed inside it. Such inspection is done by storing used cell characteristics such as image of the cell, number of bus bars, etc., and evaluating an image of the final module compared to these characteristics. Many such techniques are too complex for reliable operation and are not capable of effectively testing, classifying, and sorting individual PV devices e.g., wafer or solar cells. In view of the foregoing disadvantages inherent in the prior arts, the general purpose of the present invention is to provide an improved combination of convenience and utility, to include the advantages of the prior art, and to overcome the drawbacks inherent in the prior art. In one aspect, the present invention provides effective means for testing, classifying, and sorting/separating individual PV devices e.g., wafers solar cells, as fast as possible in a cost-effective and robust manner. In another aspect, of the present invention provides a method for testing, classifying and sorting atleast a PV device. The method comprises the steps of testing the PV device; classifying the PV device, and sorting the PV device, wherein atleast a box or storage with a smaller filling time is used for atleast a class with a higher value of PV device distribution. In another aspect, the present invention provides systems for testing, classifying and sorting atleast a PV device. The system comprises testing means capable of testing and evaluating atleast a characteristic of the PV device, classifying means for classifying the PV device, and sorting means capable of sorting the PV device on the basis of the characteristic of the PV device, wherein atleast a storage with a smaller filling time may be used for atleast a class with a higher value of PV device distribution. Sorting means includes atleast a sorters-, wherein storages in the sorter(s) for classes with higher value of PV device distribution are placed closer to the transportation means than storages for classes with lower value of PV device distribution. The system also comprises means for transporting the PV device to a consecutive process or buffer. These together with other objects of the invention, along with the various features of novelty that characterize the invention, are pointed out with particularity in the claims annexed hereto and forming a part of this disclosure. For a better understanding of the invention, its operating advantages and the specific objects attained by its uses, reference should be had to the accompanying drawings and descriptive matter in which there are illustrated exemplary embodiments of the invention. PV device, according to an exemplary embodiment of the present invention. FIG. 5 illustrates a sorter integrated in an input means, according to an exemplary embodiment of the present invention. The exemplary embodiments described herein detail for illustrative purposes are subject to many variations and structure and design. It should be emphasized, however that the present invention is not limited to a particular system and methods for testing, classifying, and sorting a PV device as shown and described. Rather, the principles of the present invention can be used with a variety of PV device testing, classifying, monitoring, sorting, separating configurations and structural arrangements. It is understood that various omissions, substitutions of equivalents are contemplated as circumstances may suggest or render expedient, but the present invention is intended to cover the application or implementation without departing from the spirit or scope of the it's claims. In the following detail description, for purposes of explanation, numerous specific details are set forth in order to provide a thorough understanding of the present invention. It will be apparent, however, to one skilled in the art that the present invention may be practiced without these specific details. As used herein, the terms 'a', 'an', 'atleast' do not denote a limitation of quantity, but rather denote the presence of at least one of the referenced item, the term 'a plurality' denotes the presence of more than one referenced items. The PV device includes atleast any one of an individual waver, a solar cell (also referred to as 'cell'), an encapsulated solar cell, an encapsulated string of solar cells, a string of solar cells, a solar panel or any combination thereof. The individual PV device typically is a waver or solar cell. The terms 'wafer' and 'solar cell' may also be used herein interchangeably. The terms 'storage' , 'storages' , 'box' and 'boxes' may also be used herein interchangeably. In an exemplary embodiment, the present invention provides improved systems and methods for testing, classifying, and sorting/ separating PV devices. The systems of the present invention may be mass produced inexpensively and provides user an easy, robust, efficient, secure, cost effective, environment friendly and productive way of testing, classifying, and sorting/ separating PV devices. In an exemplary embodiment, the present invention provides systems and methods for monitoring quality, properties, and characteristics of the PV device. These properties of the PV device includes holes, edge defects, cracks, saw marks, micro-cracks, residues, cell size, cell contour shape, busbar position and size, cell thickness and bending, busbar and finger interruptions and disconnections, colour, detection of defects in antireflection layer, shunts, inclusions and small diffusion lengths of minority carrier. The quality may be monitored through atleast a quality test. The quality test may be conducted at the end of the PV device production or at the beginning of the PV module production. The PV devices may be sorted on the basis of the quality test. The defects, for example, holes, edge defects, cracks may appear all along the PV device production line. These defects may be caused by processes or handling. The PV devices, for example, cells or wafers, with such defects may not be used any more to produce modules. The present invention is capable of detecting such defects with testing technologies, for example, electroluminescence, 2D optical inspection with IR transmitted light, etc. Saw marks appear during the sawing process of the PV devices, for example, wafers. The saw marks mechanically weaken the wafer that may breaks during the following manufacturing processes or create irregularities that may induce defects during a screen printing process. The present invention is capable of detecting saw marks, for example, with 3D optical inspection. The micro-cracks are small cracks which may not be visible to the necked eye. These micro-cracks are always present in PV devices, for example, wafers. But, only some micro-cracks are dangerous and may grow during the following manufacturing processes in the PV device, for example, the cell or the module production. The present invention is capable of detecting these micro-cracks with the techniques such as electroluminescence, photoluminescence, resonance ultrasonic vibration or the like. At the beginning of the PV device, for example, cell production, cells have to be clean, without any residues at the surface to ensure the good performance of the production. The present invention is capable of detecting all types of residues such as abrasives or dirt. The residues may be detected at the end of the wafer production with an optical inspection. Electrical proprieties, for example, Isc, Voc, Mpp, Rshunt, Rseries, the complete IV-curve are most important properties of the PV device. The present invention is capable of measuring electrical properties of the PV device. The measurement of electrical properties may be done at the end of the PV device, for example, cell production line. The measurement of electrical properties allows determining the PV device efficiency. Further, the measurement of electrical properties may be important for both cell producers and module producers, because such measurement determines the selling price of the PV device, for example the cell, and allows sorting the cells in order to produce more efficient modules. The present invention is capable of utilising flasher devices for measuring the electrical proprieties. The present invention is capable of measuring all important PV device dimensions, for example, cell size, cell contour shape, busbar position and size, to ensure the compliance with the specified tolerances and ensure the success of the following processes. The PV devices, for example, cells or wafers that do not conform to the specifications may be rejected. Measurements of PV device dimensions may be usually done with 2D or 3D optical inspection methods. Due to a bad control of the cutting process parameters, PV devices, for example, cells or wafers, may have differences in thickness. During the encapsulation of the panel, cells that are thicker are subjected to high mechanical stress. The present invention is capable of classifying wafers according to the thickness measurement. The bending measurement may also be useful for cells. Some cells, whose bending is too pronounced, may break during the soldering process. According to an embodiment of the present invention, bending and thickness may be measured with a high resolution 3D optical inspection technology. Some defects, for example, busbar and finger interruptions of tracks and disconnections, may appear during the screen printing or may be caused by cracks. These defects affect the effectiveness of the cell and may still worsen during the lifetime of the solar panel. They may be difficult to detect with standard optical inspection but the present invention is capable of detecting such defects with techniques, for example, electroluminescence inspection. For aesthetic reasons, the color uniformity of a photovoltaic panel may be an important requirement of the final customer. That's why the module producers want cells sorted by color and without any stain. The present invention is capable of detecting colors, non-uniformities, and defects in antireflection layer with a color camera. Due to a bad control of the production processes, some others defects such as shunts, inclusions and small diffusion lengths of minority carrier, may affect the efficiency of the cell. The present invention is capable of detecting of these defects thereby allowing improving the performance of the production lines of PV devices, e.g., wafers and cells. Depending on the above mentioned tests, PV devices, e.g., wafers and cells, are classified and sorted/separated. The present invention is capable of sorting PV devices as fast as possible in a cost-effective and robust manner. The sorting of PV devices may include separation of individual cells from a flow of cells. The individual cells may be transported to a consecutive process or buffer. In the latter case the PV devices may after treatment or inspection be interleaved in the normal flow of PV devices in such a way that the average filing time is reduced. A buffer may be provided to facilitate this. The sorting may be optimized so that classes that occur frequently have smaller pick and place times than classes that occur seldom. According to an exemplary embodiment of the present invention, if some of the actions and thus the times needed for the actions, for example, Ttrans(class), Tpick, Tpiace(class), partially run in parallel, then the times needed become even smaller. In that case, the handling time of a cell is no longer independent of actions carried out before. The handling time of a cell may be smaller than an action started before and thus be done completely in parallel. If the time needed for the previous action is shorter than the handling time, the handling can not be done completely in parallel. This makes the calculations more complicated but the present may still be used by optimizing the total time needed, e.g. average processing times may be used for the optimization. According to an exemplary embodiment of the present invention, in order to optimise the sorting process, the classes with the greater wafer distribution may be distributed in a plurality of storages (also referred to as 'boxes') so that these classes may be sorted in parallel, this allows to significantly reduce the average time Tpiace- The cells may likely to belong to the class with the greater wafer distribution. Referring to FIG. 1, which illustrates a method 100 for testing, classifying and sorting atleast a PV device 99 (as shown in FIG. 2), according to an exemplary embodiment of the present invention. The method 100 comprises the steps of testing the PV device 99 at a step 110; classifying the PV device 99 at a step 120, and sorting the PV device 99 at a step 130, wherein atleast a storage, for example, Box 1 (as shown in FIG. 2), with a smaller filling time is used for atleast a class, for example Class 1 (as shown in FIG. 2), with a higher value of PV device 99 distribution. In general with filling time the time is meant it takes to store a PV device 99 in any of the storages 9, 11, 12, 13, 14 (as shown in FIG. 2). The filling time may consist of the time needed for picking up the PV device 99, transporting and placing the PV device 99 to in any of the storages 10, 11, 12, 13, 14. The PV device distribution is the frequency of devices 99 of a certain type occurring in a given population of PV devices 99 as a function of the type or class. Classes differ in any property, the latter being e.g. dependant on, but not limited to the number and type of cracks, the conversion efficiency, carrier life-time etc., as well as geometrical or esthetical properties such finger or bus bar alignment, breakage, colour. The PV devices 99 may be placed in any kind of storage, such as, but not limited to a box or a container. 'statistical model' or 'sorter') for testing, classifying, and sorting atleast a PV device 99, according to an exemplary embodiment of the present invention. The system 200 may comprise a plurality of sorters 9, 11, 12, 13, 14 capable of working in parallel. Each of sorter 9, 11, 12, 13, 14 equipped with a two axes gripper 80, a conveyor 40 (also referred to as 'conveyor band' or 'conveyor'), and a buffer 30 from which the PV device 99, for example, a wafer or a cell, may be picked. Each of sorter 9, 11, 12, 13, 14 may contain a plurality of storages, for example, Box 1, Box 2, Box 3, Box 4, Box 5. The storages Box 1, Box 2, Box 3, Box 4, Box 5, ...etc., may be placed vertically. The conveyor 40 may be a clocked conveyor band. A cycle time of the conveyor 40 is the time to pick the PV device 99 from the buffer 30, for example, if more the time to transport the PV device 99 to a first sorter 10 then more the time to pick the PV device 99 from the conveyor 40. For each cycle time, atleast a PV device 99 may be loaded on the conveyor 40, unless none of the sorters 9, 11, 12, 13, 14 is available. In this case the conveyor 40 goes a step forwards without loading any PV device 99, for example, if a PV device 99 may be placed in Box 5 of the sorter 10 (first sorter), the conveyor 40 may transport the PV device 99 in 0.3 seconds and the gripper 80 may pick the PV device 99 up in 0.3 seconds. If the PV device 99 is placed in the sorter 13 (third sorter), the convey or40 may still pick the PV device 99 up from the buffer 30 in 0.3 seconds but an additional 1.2 seconds to transport the PV device 99. If the PV device 99 be placed in the lower storage, for example Box 11 of the sorter 13, then 2.4 seconds processing time may be added. If the PV device 99 may be placed in an upper storage for example Box 15, an additional 2 seconds time may be needed. Referring to the Table 1, which is the table of PV device 99 distribution for each class that may be used in the method 100, according to an exemplary embodiment of the present invention. The cycle time may be reduced. 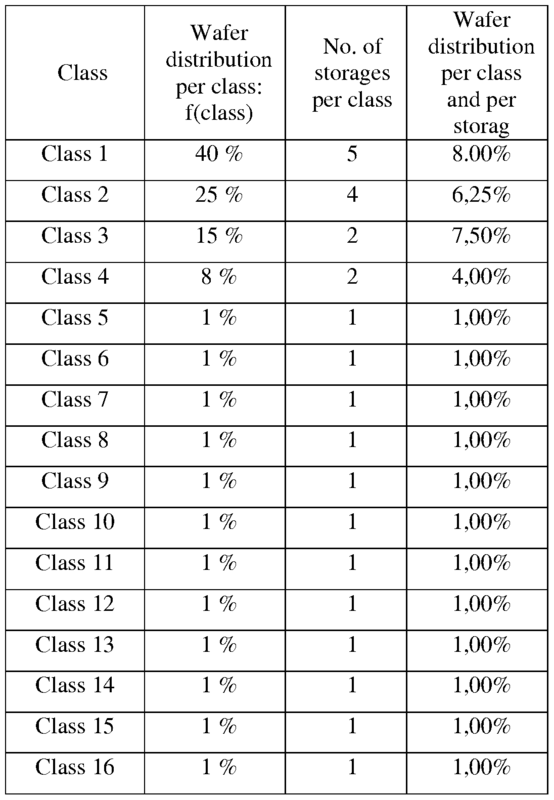 Firstly, atleast a class, for example, class 1, may be assigned to atleast a storage, for example Box 1. Secondly, a plurality of storages, for example, Box 1, Box 6, Box 11, Box 16, Box 21, may be assigned to the same class, i.e., the class 1. The greater the value of PV device 99 distribution per class, the greater may be the number of attributed storages for this class. From the Table 1 it is clear that most PV devices 99 may be assigned class 1 , so that one may calculate the distribution of PV devices 99 per class and per storage. Therefore more storages Box 1, Box 6, Box 11, Box 16, Box 21, may be dedicated to this class. 13, Box 18, Box 23; the storage 4 may includes atleast any one of the Box 4, Box 9, Box 14, Box 19, Box 24; and the storage 5 may includes atleast any one of the Box 5, Box 10, Box 15, Box 20, Box 25. The filling time may be the time needed to store a PV device 99 in its final storage or in an intermediate buffer. The latter case may be used to speed up the process even more. An intermediate buffer, possibly larger than the storages that may be accessed possibly in shorter times than that of the 'fastest' storage ma be used to buffer PV devices 99, for example, if class 1 storages i.e., Box 1, Box 6, Box 11, Box 16, Box 21, are all busy, then the PV devices 99 are buffered and interleaved later when this is possible. In this way the PVD flow may never to be slowed down. If the intermediate buffer is lager, it may be emptied into the storages when the tester is running and or no personal is around to provide new PV devices 99 to the system, for example, at night. This intermediate buffer may also be used to collect PV devices 99 of a certain class as fast as possible. All other classes are stored as normal, just this one class may be collected faster. If the buffer is full, the PV devices 99 are stored in their normal storages. According to an exemplary embodiment of the present invention, each of the sorter 9, 11, 12, 13, 14, may have a timer. When any one of the sorter 9, 11, 12, 13, 14 is selected, an expected time to fill the storage, for example, Box 1, Box 2, Box 3..etc, may be added to the timer of the selected sorter. Then with each step, the cycle time may be subtracted from all the timers. When the sorter timer is zero, then the sorter may be available to load the next PV device 99. Normally the first available sorter, or example sorter 10, may be is selected, but when it remains a choice possibility for selecting the sorter, preferably the farthest one sorter, for example, the sorter 14, may be selected. 3, etc, may be emptied then they are sometimes unavailable. Depending on the time required to replace storages and the number of storage changes per time unit, there may be two possibilities to minimize the time during which the entire system may be blocked, for example, atleast two storages may be assigned to one class or one storage may be kept empty and/or the empty storage may be used for the class of the storage that may being emptied, i.e., the empty storage may only be used for classes that may have only one storage. The number of sorters and storages within a sorter, may be selected to reach the average required cycle time. According to an exemplary embodiment of the present invention, the system 200 may be optimized by utilizing atleast an optimization algorithm, that may be selected from a group consisting a Huffman and entropy coding algorithm, a least square error algorithm, a simulation algorithm, a pattern recognition algorithm, a neural networks algorithm, Monte Carlo algorithm individually or in any combination thereof. The Optimization may be done during development of the machine, in a test run or continuously during normal operation. Since the time needed for the handling of the PV device 99 differs from the time needed for the testing, the input buffer 30 may be needed to store the PV devices 99 coming from a previous process. Normally the PV devices 99 are delivered in cassettes that may be put into the machine manually. In this case, they make out the input buffer 30. According to an exemplary embodiment of the present invention, the system 200 may be updated depending on the classification of the PV devices 99. The system 200 may be made dependent on the manufacturer or type of the PV devices 99 being sorted. The system 200 may be capable of indicating what storages, for example, Box 1, Box 2, Box 3, etc., may be replaced by storages for other classes or be relocated to optimize the cycle time of the sorting process. An automatic calculation may be carried out to indicate how the system 200 may be optimized and economical parameters such as PV devices 99 stored per time unit or return on invest may be shown. CPUs available in the system 200 may be used to run simulations of other optimization algorithms. This may be done during normal operation or at certain designated time slots (over night). It may be done using all available data or a subset. According to an exemplary embodiment, the present invention is capable of selecting a desired class while not sorting at least two other classes, for example, if PV devices 99 of a certain class are needed right away, the optimization may be adjusted to increase speed while only sorting out that class. The PV devices 99 of all other classes may be stored in one temporary buffer 30b (as shown in FIGS 3 and 4) to be sorted out later. Box 2, Box 3, etc., may be annotated with a certain class, for example, RF-ID, bar code, colour, electrical contacts, etc. Atleast any one of the sorter 9, 11 , 12....etc., is capable of determining the classes, for example, RF-ID, bar code, colour, electrical contacts, etc, of all storages and determines where to put the PV devices 99 depending on the available storages Box 1, Box 2, Box 3, etc. ....etc.. This way the class of each storage Box 1, Box 2, Box 3, etc, may be altered as needed during sorting. The label may also be an electronic means such as RF-ID that have to be read electronically. According to an exemplary embodiment, the present invention is capable of providing atleast an adjustment to atleast any one of an added sorter, a removed sorter, a defective sorter, a full storage, a missing storage, a replaced storage, a relocated storage, a nearly filled storage, a change in PV device 99 distribution individually or any combination thereof. For example, if an additional sorter is added or a sorter is removed the system 200 may automatically adjust to the added or removed sorter. Further, an adjustment to full or missing storages may be provided, for example, if a storage is missing (being replaced or relocated), the system 200 may automatically adjust to the missing storage. The term 'nearly filled' may mean that a certain percentage of the storage is filled. Also it may mean that based on the distribution, the expected time needed for filling the storage may be calculated and an alarm may be set off a giving time before this happens. Also if storages of a first class are all full, storages of other classes may be assigned to this first class and the label may be cached electronically. The label may part of the storage or be part of the sorter. According to an exemplary embodiment, the present invention is capable of providing storage of the PV devices 99 in atleast any one of a nonsequential manner, sequential manner, random manner or in any combination thereof. The PV devices 99 may not have to be picked-up in the order they are fed to the sorter 9, 11, 12, ...etc., for example, a cell may stay on a transporting means while wafers behind the cell may be picked-up. This way the PV device 99 may in time reach his sorter 9, 11, 12, ...etc., and be picked up then. It may be possible that the transporting means speed-up to transport the PV device 99 to its sorter 9, 11, 12, ...etc., before another PV device 99 is places on the same. Generally, the transporting means may be a conveyor 40 that runs intermittently. The PV device 99 may even be moved past his sorter and moved backwards to reach the sorter. The optimization algorithms may use any trick to speed-up the sorting. If the system 200 has multiple input buffers 30, then the PV devices 99 from multiple buffers 30 may be used successively. Since PV device 99 in one buffer 30 may come from one machine or process, the correlation of the classes of devices in one buffer 30 may be higher than devices from different buffers. According to an exemplary embodiment of the present invention, if a certain class has no storage, the PV devices 99 may be placed in a temporary buffer 30b to be sorted later. If only the PV devices 99 of a certain class are put into the temporary buffer 30b, an indicator may display the class of the PV devices 99, so that it is known what class they belong to. The PV devices 99 may be put into the appropriate manually if a storage for that class is available again. The sorter 9, 11, 12,...., etc., may remember the classes of the PV devices 99 it put into the temporary buffer 30b, so that the sorter may handle them efficiently afterwards. The sorter 9, 11, 12,...., etc., may interleave the PV devices 99 stored in the buffer 30, 30a, 30b in the normal flow of the PV devices 99 in an efficient manner. Further, alarms may be used to indicate that a storage i.e., Box 1, Box 2, ...etc., is missing so that a PV device 99 may not be stored even if the temporary buffer 30b is used or the temporary buffer 30b is full. The sorter 9, 11, 12, ....,etc, may be shut down if a PV device 99 may not be stored correctly. Box 2, ...etc., are full the present invention is capable of automatically adding atleast a step selected from offloading the storages i.e., Box 1, Box 2, ...etc.,, replacing the storages i.e., Box 1, Box 2, ...etc., or any combination thereof. It may be advantageous because if this operation is done manually, it may require the entire attention of a person but may not represent a 100% job. Moreover, it is likely that several storages i.e., Box 1, Box 2, ...etc., have to be replaced at the same time, this may be done with an automatically system but not with a single person. The present invention is capable of providing a system such as a robot fully automatic or a system semi-automatic that does an exchange between the filled storage (not necessarily completely full) and the empty storage. PV device 99 handling may be done (partially) in time parallel. This increases the speed even further, but the optimization becomes more complicated and can most likely not be done analytically. Referring to FIG. 3 which illustrates a system 300 for testing, classifying and sorting atleast a PV device 99. The system 300 comprises testing means 20 capable of testing and evaluating atleast a characteristic of the PV device 99, and sorting means 10 capable of sorting and classifying the PV device 99 according to the class or on the basis of the characteristic of the PV device 99, wherein atleast a storage with a smaller filling time is used for atleast a classes with a higher value of PV device 99 distribution. The testing means 20 may includes a test unit 20a which is capable of incorporating a plurality of testing technologies.The system 300 also comprises means for transporting 40 the PV device 99 to a consecutive process or buffer 30a, 30b, etc., for example, transporting the PV devices 99 from an input buffer 30 to the testing means 20 or transporting the PV devices 99 from the testing means 20 to the sorting means 10. According to an exemplary embodiment of the present invention, means for picking and placing the PV device 99 may be adapted. The picking means that picks the PV device 99 to be stored from the transporting means 40 may be independent from the placing means that places the PV device 99 in the buffer 30a, 30b, etc., for a class of the PV device 99. In this way, the picking means may be used as a buffer for one PV device 99. Also both the picking and placing means may be optimized for picking and placing purpose. In FIG. 1, one system picks the PV device 99 from the conveyor 40, while on other system transports the PV device 99 to the storage 9, 11, 12, 13, 14 the PV device 99 has to be placed in. PV device 99, according to an exemplary embodiment of the present invention. According to an exemplary embodiment of the system 400, the input buffer 30, the testing means 20, the sorting means 10 , and the transportation means 40 may be configured in a modular way, so that atleast an additional buffer means 30b may be added to the input buffer (input means) 30a, atleast an additional tester may be added to the testing means 20, atleast an additional sorters may be added to the sorting means 10, and atleast any one of an additional buffer means 30b, a testing means 20, a sorting means lOor any combination thereof may be added. The testing means may includes a plurality of test units 20a, 20b, 20c, etc. The sorting means 10 includes a plurality of sorters 9, 11, 12, ....etc. The testing means 20 may include atleast any one of electroluminescence testing, 2D optical inspection, 3D optical inspection, flasher or any combination thereof. Luminescence is an optical radiation, which a system emits when an electron transits from an excited state to the ground state. Luminescence occurs with the radiant recombination of excited electrons. According to the electroluminescence testing, electrons are excited by an electrical current and the emitted photons are captured with a camera. The electroluminescence testing allows knowing the lifetime of charge carriers. Defects in PV devices 99, for example, silicon solar cells, may be recombination centres where diffusion length and lifetime of minority carriers decrease sharply. Differences in diffusion lengths of minority carriers lead to contrasts in EL-images. Defects such as cracks, shunts, etc, appear darker and are so identifiable. Also photoluminescence may be used. 2D optical inspection of the PV device 99 may be done with or without illumination with a standard camera. The camera may be capable of capturing a 2D image of the PV device 99. Depending on lighting conditions, different characteristics of the PV device 99, for example, cell or wafer, may be detectable. With IR transmitted light, the characteristics such as the edges of the cell, chips, and large cracks may be detected and measured. With spot light the busbars and the fingers may be detected and measured. 3D optical inspection of the PV device 99 may be done, with the standard camera and a technology like holography, triangulation, interferometry, stereo, time of flight, etc., that allows having a 3D image of the PV device 99. On the image, large cracks, chips, edges of the cell, busbars, the cell bending and thickness may be detected and measured. According to an exemplary embodiment of the present invention, the flasher may be adapted to measure electrical characteristics of the PV device 99. The flasher may simulate the sun, projecting light on the PV device 99, which may be electrically contacted with an electronic load. The light of the flash may be produced by a xenon tube. The light may be a perfectly calibrated spectrum with uniformity and temporal stability. During the flash, the electronic load applies a voltage ramp across the PV device 99and measures the resulting voltage and current. This measurement allows drawing the IV-curve and calculating the PV device 99 electrical characteristics, for example, Voc, Rshunt, Rseries, Pmpp, Impp. The IV-curve is a plot of an output current of the PV device 99 versus a corresponding output voltage. The IV-curve determines a quality of the PV device 99 by determining an output power of the PV device 99 at every desired voltage by multiplying it with the according current. According to an exemplary embodiment, the present invention is capable of utilising a plurality testing technologies such as colour detection, photoluminescence, thermography inspection, resonance ultrasonic vibration, and the like. Further, one or multiple CPUs may be used to control and process the information from the different testers. PV device 99 is assigned a class of broken or defective PV device 99 before all testing may be done, the PV device 99 may proceed to a storage such as a rubbish bin, without any further testing. Additional transporting means 40a or 40b may be provided for transporting the PV device 99 of the rubbish bin. According to an exemplary embodiment of the present invention, special component parts may be adapted to speed-up the sorting process. Some component parts may be more powerful than others with the same function. This may lead to an additional speed-up if classes that occur frequently may be stored more quickly. Use of additional buffers may also allow for further optimization. Referring to FIG. 5 which illustrates an integrated input stage wherein the sorting means 10 may be integrated with an input means, according to an exemplary embodiment of the present invention. The Input means and the sorting means 10 may have certain parts in common, such as a frame, a robotic arm or manipulator, transportation means. The test units 20a, 20b, 20c are capable of testing the PV devices 99 and transporting means 40a, 40b, ..etc., are adapted to transport the PV devices 99. Sorters 9, 11, 13..., etc, are adapted to sort the PV devices 99. According to an exemplary embodiment of the present invention, a two level transport means 40a and 40b may be adapted. If the sorting means 10 and the input means are integrated in one unit, the PV devices 99 may be fed to the testing means 20 on a first transporting means 40a and returned to the sorting means 10 on a second testing means that may be mounted one above the other. According to an exemplary embodiment of the present invention, storage indicators may be adapted to point to the storage that may needs attention such as storage is missing, storage is full, storage is almost full, etc. This indicator may includes a light near the storage, two lists of light indicating respectively the x and y position of the storage, a display displaying all storages and highlighting the relevant storage or the like. Normally floor space may be more of an issue in production plants than height. According to an exemplary embodiment of the present invention, the storages of the input buffer 30 and or the sorter 10 may respectively be placed vertically, i.e., atleast partially one above the other. This way the foot print or floor space of the sorter may be kept small. According to an exemplary embodiment of the present invention, a data base is adapted for holding atleast any one of the measured characteristics, a data derived from the measured characteristics or any combination thereof. Also after the end product or PV device 99 has been manufactured, the data can be retained for long term testing. Although a particular exemplary embodiment of the invention has been disclosed in detail for illustrative purposes, it will be recognized to those skilled in the art that variations or modifications of the disclosed invention, including the rearrangement in the configurations of the parts, changes in sizes and dimensions, variances in terms of shape may be possible. Accordingly, the invention is intended to embrace all such alternatives, modifications and variations as may fall within the spirit and scope of the present invention. The foregoing descriptions of specific embodiments of the present invention have been presented for purposes of illustration and description. They are not intended to be exhaustive or to limit the invention to the precise forms disclosed, and obviously many modifications and variations are possible in light of the above teaching. The embodiments were chosen and described in order to best explain the principles of the invention and its practical application, to thereby enable others skilled in the art to best utilize the invention and various embodiments with various modifications as are suited to the particular use contemplated. It is understood that various omissions, substitutions of equivalents are contemplated as circumstance may suggest or render expedient, but is intended to cover the application or implementation without departing from the spirit or scope of the claims of the present invention. wherein atleast a storage with a smaller filling time is used for atleast a class with a higher value of PV device distribution. 2. The method according to the claim 1, wherein the storages are placed in a sorter based on an expected class distribution of the PV devices in such a manner, that the average time needed for storing the PV device is reduced. 3. The method of according to claim 2, wherein the sorter is capable of remembering and handling classes of the PV devices put by the sorter into a temporary buffer, wherein the sorter is capable to interleave the PV devices stored in the buffer in the normal flow of the PV devices. 4. The method of one of the previous claims, wherein a plurality of the storages with the same classes are placed in a plurality of different sorters to fill the storages in parallel, wherein handling of the PV device is done in time parallel. 5. The method of one of the previous claims, wherein the optimization is done atleast any one of before or during testing, classifying, sorting or any combination thereof by utilizing atleast an optimization algorithm. 6. The method of one of the previous claims, wherein the system is capable of automatically providing atleast an adjustment to atleast any one of an added sorter, a removed sorter, a defective sorter, a full storage, a missing storage, a replaced storage, a relocated storage, a nearly filled storage , a change in PV device distribution individually or any combination thereof. 7. The method of one of the previous claims, wherein once the storages are full the method is capable of automatically adding atleast a step of an offloading the storages, replacing the storages or any combination thereof. 8. The method of one of the previous claims is capable of providing storages of the PV devices in atleast any one of a non-sequential order, sequential order, random order or in any combination thereof. sorting means capable of sorting the PV device according to class, wherein transposition means area adapted to transport the PV device, wherein atleast a storage with a smaller filling time is used for atleast a class with a higher value of PV device distribution. 10. The system according to claim 9, wherein the sorting means includes atleast one sorter, wherein storages in the sorter(s) for classes with higher value of PV device distribution are placed closer to the transportation means than storages for classes with lower value of PV device distribution. 11. The system of one of the previous claims, wherein atleast an indicator is adapted to indicate atleast any one of a missing storage, a full storage, an almost full storage, a storage needs an attention, what storages are to be replaced or to be relocated or any combination thereof. 12. The system of one of the previous claims, wherein if the sorting means and the input means are integrated in one unit, the PV devices being fed to the testing means on a first transporting means and returned to the sorter on a second testing means. 13. The system of one of the previous claims, wherein atleast a buffer is adapted to insert the PV devices into the system. 14. A method for testing, classifying and sorting atleast a PV device as used in one of the previous claims.